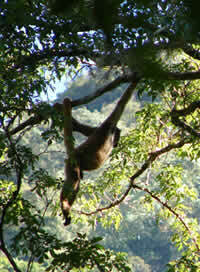 Muriqui photographed on REGUA's Red Trail in April 2007. Photograph by Neil Burchett. Sightings of the critically endangered Woolly Spider Monkey, Brachyteles arachnoids, also known as the Muriqui, have been recorded on the 6,500 ha Reserva Ecological de Guapi Assu (REGUA) situated in Três Picos State Park in Brazil. Observations of the Muriqui have occurred on a number of trails throughout the reserve and group sightings indicate that there is a healthy population of males, females and young. A group of 15 individuals was seen in April 2007 on REGUA's red trail. The Muriqui is the largest primate within the Neotropics and is Brazil's largest endemic mammal species. 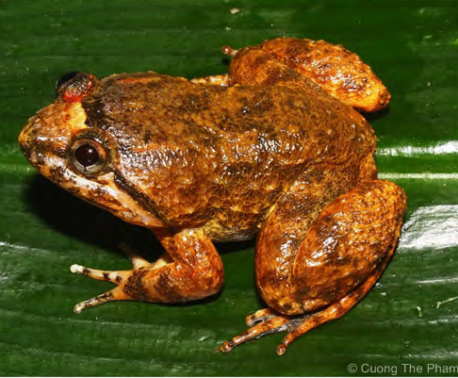 Their total range is now limited to fragments of Atlantic forest and they are usually found at the higher altitudes within the REGUA reserve. 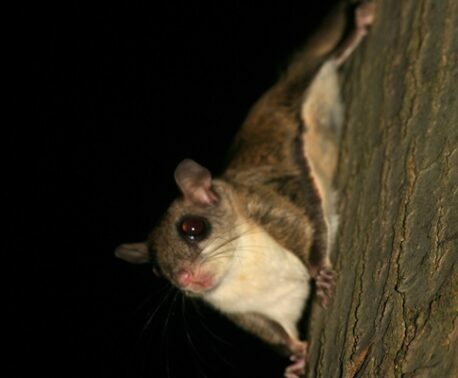 They are very arboreal, rarely descending to the forest floor, and often feed by hanging from the branches of a tree with their prehensile tail. Young leaves, fruits and seeds constitute a large part of their diet. The world's total population is estimated to be in the region of 1,000 individuals. The combined area protected by REGUA, Três Picos State Park and Serra dos Orgãos National Park provide continuous forest cover of approximately 60,000 ha, which is large enough for several separate populations of Muriqui to survive without direct competition, although they do not show signs of being territorial. Little is known about the lifespan and habits of the Murique but, with further research and surveying, REGUA hopes to be able to help increase the understanding of Muriqui ecology and to establish how many occur on the reserve.